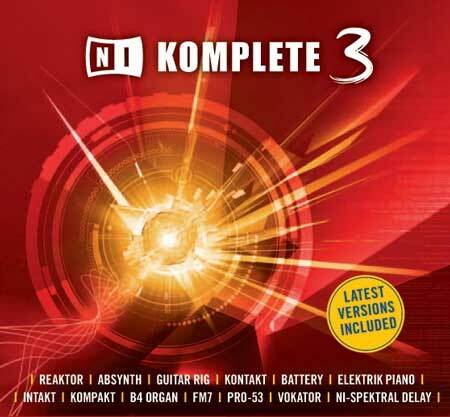 NI Komplete 3 is the ultimate bundle for musicians and producers. production, instrument, and sound design. BATTERY 2 is the professional choice. HALion, EXSª, AKAIª, and other common formats. electric piano with unprecedented authenticity, playability, and charm. ease-of-use and all the power and flexibility of modern software. West provides sample source material for nearly any musical style. granular sampler: a virtual sound-fusion laboratory. stereo signal into as many as 160 separately modifiable frequency bands. User library is growing every day. Time Machine II, VST automation and much more. WINDOWS XP, PENTIUM or Athlon 700 MHz, 256 MB RAM, DVD Drive, 5.5 GB free Disk Space. Mac OSX 10.4.x, G4 1GHz, 1GB RAM, DVD Drive, 5.5 GB free Disk Space.